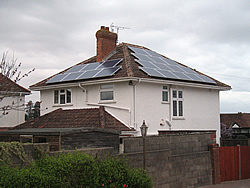 Suppliers & installers of PV panels, evacuated tubes and flat panels. Suitable for many applications, the evacuated tube panel (ClearSkies approved) can produce very useful amounts of hot water even in winter, as the system relies only on good daylight. MCS approved Monocrystalline or Polycrystalline PV panels. Domestic hot water systems both vented and pressurised, working independently of any primary heating system, i.e boiler or immersion, thus complementing any existing systems efficiency and extending its lifespan. Combi boiler via heat store. Swimming pools and hot tubs via heat exchanger. "Solar water heating systems can provide over half of a uk household's hot water requirements over the year."